I think Valentine’s Day is so fabulous because it gives us all an excuse to eat chocolate, be romantic, wear hot, passionate red and eat Italian with no guilt! 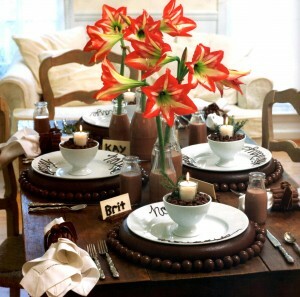 Dark Chocolate (with a touch of cayenne) and tulips are my choices of deliciousness. 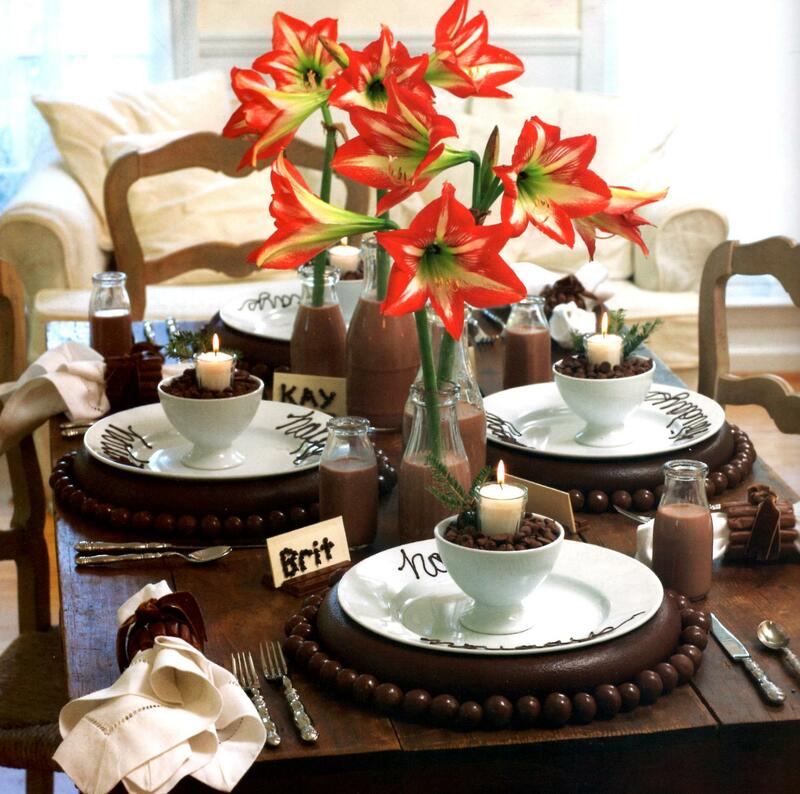 I found inspiration for a chocolate Tablescape from a Southern Living article, which shows the picture from above. The next few pictures show a tablescape I did for a client for a business luncheon she was having at her home. 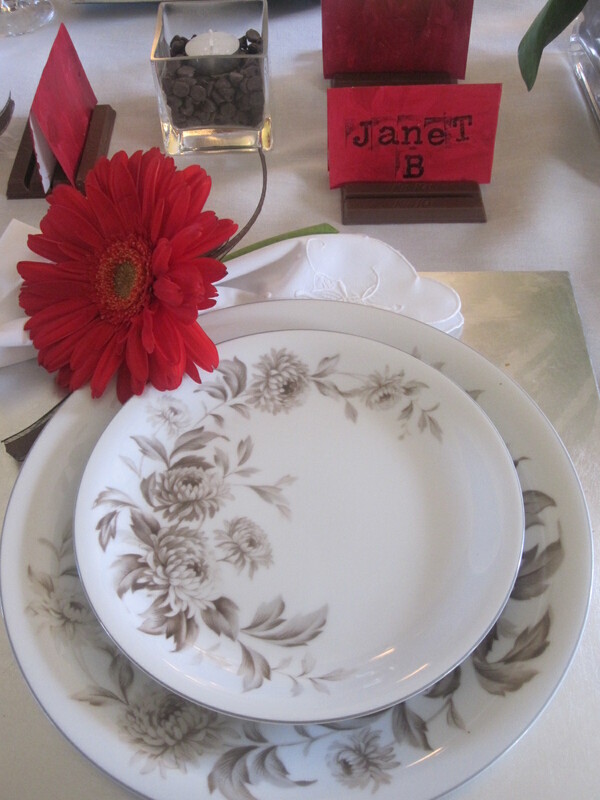 We used her grandmother’s china that had a chocolate brown floral motif. To make it a little more contemporary we added silver square chargers, framed in by traditional silver flatware. 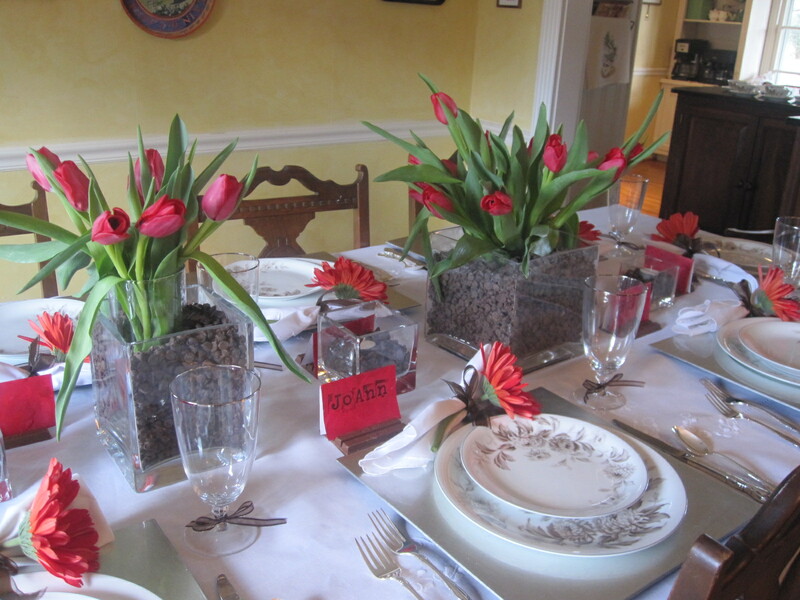 The centerpieces are brilliant red tulips in a glass vase surrounded by coffee beans (make sure you air out the coffee beans for atleast a week before use to decrease their potent smell). I painted cardstock placecards in red tones, stamped the guests’ names on them and placed the cards on kitkat candybars to hold them up. Votives were filled with chocolate chips so that when they were lit the smell of chocolate filled the air .. yummy! We topped off the place setting with a pop of red using a large gerber daisy – stunning! Remember that when a table looks delicious and inviting, the food tastes so much better! According to my client, the guests talked for weeks about the table, not about the food – yeah! Take the time to make your table, floor, bedroom, coffee table, or wherever you want to spread out a romantic meal, and make it look beautiful with fresh flowers, candles, soft music, and you have a perfect Valentine’s evening for someone special. It’s amazing how surprised people are when they see the effort you put forth “just for them.” Go ahead, make someone’s day! Have a very special Valentines Day! 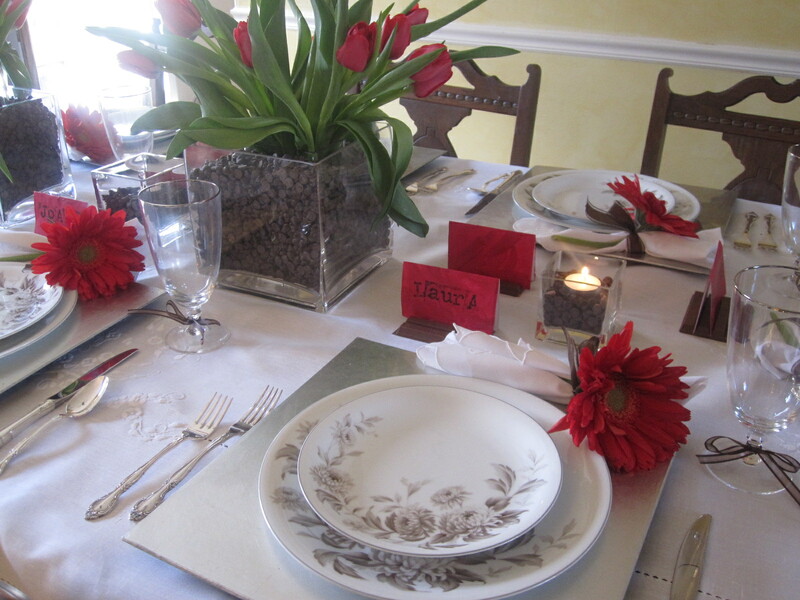 This entry was posted in Valentines Day, Valentines Day Table and tagged Chocolate, Romance, tablescapes, Valentine's Day. Bookmark the permalink.